Buy This Tour as a Gift Voucher. Join us on New Zealand’s best dolphin swimming experience in the shimmering, flat waters of the scenic Marlborough Sounds. Swimming with wild dolphins is a genuine bucket list activity – we never get tired of seeing the joy and wonder on the faces of our swimmers! Once spotted, we’ll cruise with the dolphins and get you ready to swim if conditions allow. As a permitted operator, we abide by the rules and regulations established for dolphin swimming and viewing activities. If conditions are good, then we’ll place you in the water where you will experience a real adventure for your soul – an experience you’ll never forget. Whether it’s watching a group quietly cruising along or marvelling at their high leaps, backflips and somersaults during social bouts, dolphins are a truly magnificent sight! Our degree qualified guides are there to make sure you (and the dolphins) have the best and safest experience possible. Our special Department of Conservation permits allow us to seek out and interact with all species of marine mammals that live in the Sounds. We’ll take you there and provide respectful interactions with these amazing creatures. You’ll see more than just dolphins. We pride ourselves that on an E-Ko tour, we will show you a wider variety of wildlife species than on any other NZ marine tour. Once you come out of the water, your guides will be waiting with hot drinks and cookies which you can enjoy while we cruise back to Picton. 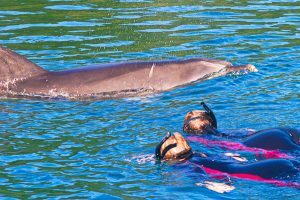 It’s worth noting that you don’t have to swim with dolphins – we have our Motuara Island tour (our most popular) – which not only takes in dolphins, but has the added bonus of spending an hour on a wildlife sanctuary – so you have the opportunity to see a much wider variety of wildlife. And of course, don’t forget our ‘no seasickness guarantee’ – our waters are so calm that in over 10 years of operation we have never had a guest suffer from seasickness – no one else is willing or able to offer this guarantee! All equipment is provided for you. Just bring your swimwear, a towel, your camera and a sense of adventure. Prices include all equipment and gear – just bring your swimwear and a towel. 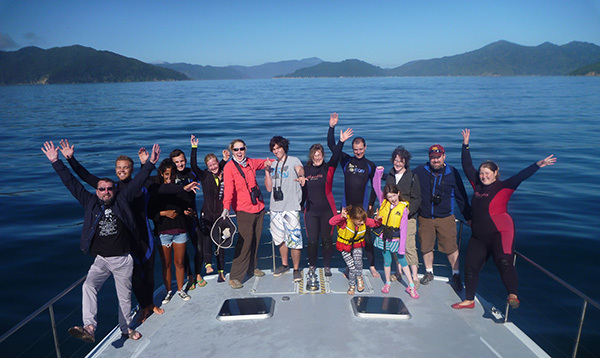 Even though this tour is in the sheltered waters of the Marlborough Sounds, it is still an open ocean experience and in order to swim with the dolphins, you should be confident in the open ocean. You’ll need to sign a declaration stating you are medically fit and healthy and also a liability disclaimer if you are participating in the swimming experience. If you have any concerns please call us and chat to us about your suitability to participate in this tour. Swim with dolphins – an ultimate experience! Had the most amazing experience yesterday! Saw probably a dozen dolphins up close (so close you could almost touch…but remember, don’t touch the special sea friends). Sunny day, water not too cold. Staff was knowledgeable, friendly and as excited we were. All in all, a beautiful time out. Booked last minute for the dolphin swim. Truly fantastic experience. Nice and warm in the sea despite being autumn thanks to thick wetsuits. In the water had lots of close up views of dolphins swimming around us, and on the boat the dolphin viewing was incredible. Couldn’t recommend enough! Loved it! The crew, the boat… the dolphins! Everything was awesome!